TechRadar's video gnomes have been sifting through the rumours on the Surface phone to bring you a video on how it might look. The Microsoft Surface tablet has been launched to mixed reviews so far, but that hasn't stopped the Redmond firm bullishly pressing on with plans for its own hardware. The software-based firm hasn't confirmed that it's working on a Surface phone, but the notion that it would be mirror its work in the tablet space makes sense. It used the larger Surface device to show how it wanted the hardware to work with Windows 8, and repeating the trick makes a lot of sense for Windows Phone 8. A Surface phone would have to bridge the gap between providing decent enough specs while not pushing the boat out beyond the price levels and specs we'd expect from its manufacturing partners. However, there's a lot that can be done with a Surface phone: for instance, a flip cover that protects the screen but also doubles as a firm keyboard? How about a USB 3.0 slot for dedicated peripherals and charging? Makes a lot of sense for us. Enough of the words though – make sure you check out the video. 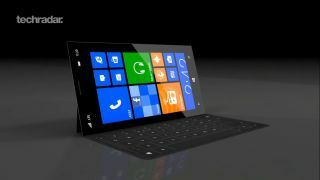 Sure, it's not based on any fact, and it hasn't got industry leading specs either…but knowing Microsoft as we do we can't help but think this is what we'd see in a Surface phone.